It's a definite yes from the experts! Check out this amazing letter from an ERGObaby fan who knows her onions! I am a prenatal chiropractor in Los Angeles who you sent a Heart to Heart insert and ERGObaby carrier to. I am so very excited about your new insert and so excited to tell you about all of the success I’ve had in spreading the word about your awesome products! Regarding the new insert, I cannot say enough good things about it! The spinal support that it provides to newborns/infants is superb, with the focus being on the sacrum, pelvis and even hips where they need it the most. I really appreciate that baby can be snugly supported against the parent so as mom or dad is moving around the baby’s neck and spine are comfortably held in place – no flopping like with other carriers, and even so much better than the old insert. Another feature that is so very important for developing infants is that they can be placed into the carrier in their natural “frog legged” posture until their hips are ready to spread on their own. I am frequently applauding new parents for wearing their babies in whatever carrier they have chosen, and then find myself gently discussing why specific features of their carrier could be better. Now I find myself pulling out the ERGObaby carrier while I have this discussion so that the parents can visualize and even test out this healthier choice for both baby and parent. All too often it is not until babies have developed lumbo-sacral or hip trouble that parents think about the various postures their babies have been in that may have caused it. It has been my mission for some time now to support the use of wraps and carriers that do not force a baby’s hips to be externally rotated and excessively spread prior to when the baby is developmentally ready for this posture. I am so happy to say that you have successfully designed a product that enables parents to use one carrier throughout the development of their baby! So thanks to your generosity in giving my office the ERGObaby and infant insert I am able to educate more parents early on – as in during pregnancy – about the benefits of a carrier that grows with their baby. This has certainly helped to create much healthier and happier new parents. On a personal note, I have a four month old daughter Geneva who I walk daily in the ERGObaby carrier with the new insert (though I think she is soon to outgrow it). Many of my patients have seen me walking around town and into the office with her in the ERGObaby carrier and if we haven’t already discussed it as an option for them, we suddenly have new motivation to. Many friends of mine have converted to your carrier as well after hearing about the long walks and adventures both my husband and I have had with Geneva in her carrier. 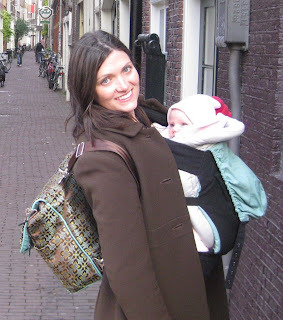 In particular we went to Berlin, Germany when she was 10 weeks old and your ERGObaby carrier was a life-saver! We would walk the city from early morning to late evening with her bundled in a snowsuit sitting cozily in her carrier. She’d come out to nurse or stretch while we rested for coffee or meals, and then she would happily settle back in for another nap. I am happy to report that I carried her for days like this with no back pain or fatigue whatsoever! I have attached a photo from this trip as it was such a special time for us that was made even more enjoyable with ease of the ERGObaby carrier. It has been such as joy to speak with ERGObaby users who haven’t seen the new insert yet…or until they see me with it. At least once a week I am stopped at the farmer’s market or on a hike and parents will tell me about when they used the old insert and how it was more cumbersome for them. I happily tell of the developmental benefits of the Heart to heart and people seem so happy and eager to try it with their next baby or to tell a friend. Thanks again for creating such a fantastic product, and for sharing it with me and my patients! I look forward to a continued relationship with your company. You can see the new Heart to Heart insert on the Belly Beyond webpage here.